11 March 2011, the were the tsunami hits Japan cause massive damage to the northern part of the country. The earth quake scale 8.9 in the pacific ocean generate a 10 meter height wall of water hit Japan after 1 hour. The country have given tsunami warning to stay away from coastal area 30 minutes before the hits. What can you do in 30 mins, pack things up and drive out ? What happen if traffic jam, what happen if you still have family members at school, home and office. Will you pick them up first ? Do you have enough time for that ? The quake not only generate devastating tsunami but also damages two of the nuclear power plant in Japan. The first power plant showing radiation leakage and an explosion has occurred few hours after the quake. Second plant lost power to cool the nuclear reactor and the backup generator were damaged by the tsunami. The power plant only runs on battery which can last for few hours. Although the power plant has been shutdown from operation but the reactor needs to be cool before it stabilized. After hours of battling, an explosion occur on one of the plant which due to overheating. The blast however reduce the pressure in the plant but the plant continue to heat up. Seeking thru possible solution, Japan power decided to use what believe the last resort is the use the sea water to cool the plant preventing from core meltdown. At this point, engineer believe the plant is not longer usable as the salt water damages the plant. Let us hope the plant will stabilize. Let us hope the intelligent from Japan able to overcome the problem and help the them rebuild Japan. Canon Malaysia Facebook is true. Why I choose this DSLR. better but I just do not know how to use Nikon camera. Sony DSLR is a good camera and ease to use when first touch of it and without much setting I am satisfied with the output of the photo. One thing the worry me about Sony is all their lens are too pricey. So there goes out of my list. My second candidate was micro four third Panasonic GF2. I was really excited when this camera about to release back in December 2010. However after a few handon with the camera, I found that the touch screen really bad as it uses pressure sensitive touch technology which was famous 6 years ago. In addition to that, the grip is really bad for a camera. With the weight of the lens on interchange lens camera, size does matter and the feel of stability need to be there. Canon 60D will be my only choice as I really like the rotatable screen. Especially taking marco shot, You able to comfortably look into the live view without twisting your neck to the max. The size of 600D really over kill for beginner like me. That leave me hopeless until the announce of 600D. 600D seems to the birth of 60D and 550D. It has the screen like 60D and the size of 550D. It just perfect. I hope my hand on when it reached Malaysia does not disappoint me. The Canon 600D price and availability in Malaysia were announced as below. The price look attractive to me as it is lower that retail price of current 550D. **Availability: End March 2011 (tentative). Finally, I bought it at one of the camera shop in Angsana, Johor. 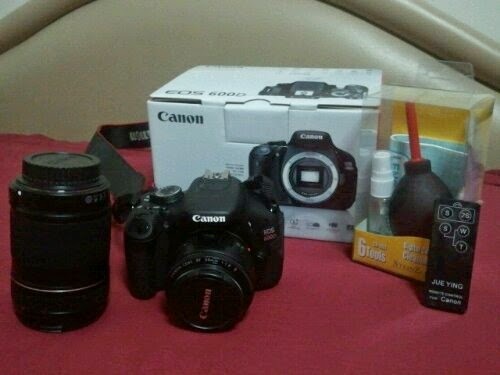 Price RM34xx for Canon 600D with 18-135mm lens. It comes with free cleaning kit, tripod, camera bag, 8GB memory card and screen protector. I top up RM 500 for additional 50mm/1.8 lens, filter for both lens, additional battery. Got addition free item after heavy bargain, 1 remote shutter, dry silica gel. Remember to pamper your camera with an Eye-Fi card. Google just announce they are working on a driver less car(or auto drive car). Looks like it is interesting to some the artificial intelligent to drive for you. Sit back and relax while it brings you to the destination. I wonder if it come with auto parking feature and wake you up when your car is well parked in the lot. I guess it been so many years that those car manufacture unable to come out with the artificial intelligent because they only have those mechanical and electronic engineer. But Google have butch of software engineers making this possible. Lets hope the software does not give you force close or send error report in the middle of the highway.